The world of scholarly publishing is in upheaval. As the open science and open research movements rapidly gain momentum, the access restrictions and paywalls of many publishers put them at odds with growing parts of the research community. Mattias Björnmalm suggests there is one way for publishers to once again become central, valued members of the research community: by pivoting from a focus on research distribution to processing and interpretation. A key challenge today is making sense of the enormous amount of new information constantly being generated. Publishers are in a unique position to develop algorithm-assisted approaches that can address this challenge; understanding and establishing networks and connections within the research literature and identifying new trends and patterns. 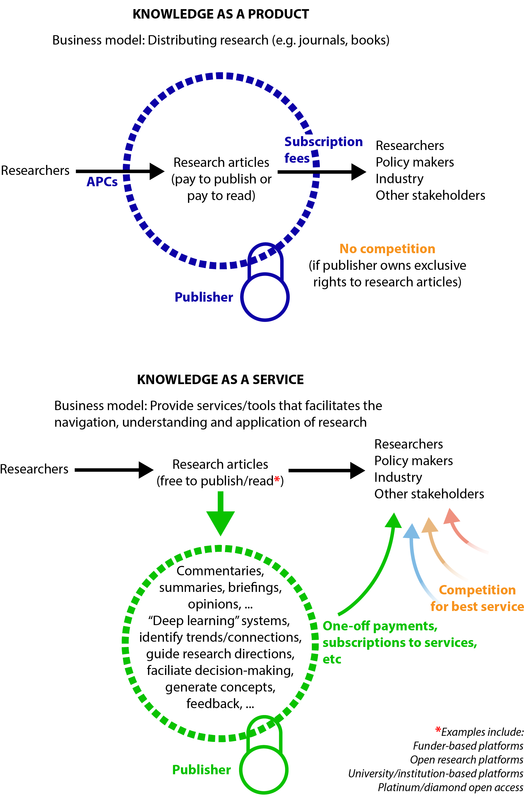 As the conventional, subscription-based model (“pay to read”) falls out of favour, article processing charges (“pay to publish”) are increasingly criticised, and new open research platforms emerge, many conventional publishers find themselves perceived to be in conflict with the research community they wish to serve. Over the last century, scholarly publishing has been instrumental in advancing research and its applications, in areas ranging from public policy to technological advances. The role of typesetting, printing, and distribution of books and journals was crucial for connecting researchers with the latest research. But in today’s electronic world researchers can share findings easily, freely, and globally in numerous ways. If the (pre-)20th century challenge was distribution of new findings, the grand challenge for the 21st century has become retrieval of important and relevant information from the ongoing deluge of knowledge generated. Today, millions of research articles are published every year, and even in highly specialised fields the rate of publication often makes it impossible for researchers to keep up with all new developments. How to best separate relevant information from an ever-increasing background of noise (i.e. not relevant work) is therefore a central issue. The challenge today is not circulating new ideas and results, but making sense of it all. And publishers may be uniquely suited to address this challenge. Academic publishers have always been situated at the interface of researchers and research. Historically, the overall objective and value of publishers was connecting researchers to work that is relevant to them, which was mainly achieved through specialised books and journals. With the explosion of new ways to share information in the digital era, the relevance of these means (printed books and journals) may not be the same as it once was, but the original, overall objective remains as relevant as ever. By moving away from today’s distribution-based model (subscription fees and article processing charges) towards a “knowledge retrieval” or “knowledge-centric” model, publishers could refocus their efforts to be better aligned with their original objective in the digital era. Innovations that manage to leverage resources, infrastructure, expertise, and connections to advance this area would create enormous value for the research community. Figure 1: Comparison of two strategies for academic publishers. Click to enlarge. A first step could be to expand on what some journals already do today, such as providing commentaries, analysis, and summaries of current, relevant research. Note that relevant is the key word here, which is also the challenging aspect. While part of this challenge can be addressed by professional editorial teams that combine their efforts with commissioned work from external specialists, the value created for the research community could be much greater if these approaches were complemented by emerging systems that can handle and process vast amounts of information in new ways. Perhaps some of the inspiration for this can come from healthcare and computer-based models, where some “deep learning” systems have already started to outperform human experts in the diagnosis of some diseases. In a research setting, these types of algorithm-assisted approaches could perhaps help in understanding and establishing networks and connections within the research literature and in identifying new trends and patterns. This could facilitate some of the core work researchers routinely do, such as identifying gaps in current knowledge, and identifying and evaluating opportunities for new research directions. It could also be useful for putting new results or proposed future studies into broader context. For example by helping researchers answer questions such as “does this make sense?”, “why did that happen?”, “how does that relate to other people’s work?”, and “what should we do next?”. Ideally, it would be like having a trusted colleague with near-perfect knowledge of the literature to bounce ideas, concepts, results, and potential new research directions off of. Examples of this are already under development (albeit with few public details available so far). These and similar types of systems (e.g. “deep learning” systems) would also benefit from the increasing availability of less conventional research outputs, such as videos, extensive method descriptions, and even “dark data”. Publishers are well-positioned to help lead these efforts as their core function has always involved interfacing with diverse research communities, libraries, and institutions as well as handling and processing research information. But to drive this, the business model of many publishers needs realignment. Today, as mentioned above, it is largely focused around journal subscriptions or article processing charges, which provides limited incentives towards developing these types of systems (e.g. computer-assisted or algorithm-assisted “research navigation” systems). If the objective was instead closer to the historical one of connecting researchers with research – i.e. a knowledge-centric model – competition would be based around who could help researchers navigate and utilise the ever-increasing volume of research outputs most effectively. This can be thought of as a shift from a “knowledge-as-a-product” model (producing journals and books) to a “knowledge-as-a-service” model (navigating research and facilitating understanding/decision-making). A culture change will also be required in the research community, where prestige of publishing venue is often used as a shorthand when assessing research, although movements to change this are slowly gaining momentum. If successful, these types of knowledge-centric efforts could streamline current research, enable full utilisation of existing knowledge, and inform new directions, thereby creating enormous value for the global, multibillion-dollar research community while benefiting everyone involved. Featured image credit: 119/365 – One old compass by Olga Filonenko (licensed under a CC BY-SA 2.0 license). Mattias Björnmalm is a Marie Skłodowska-Curie Fellow in the Department of Materials and the Department of Bioengineering at Imperial College London (UK), an Honorary Fellow of the Bionics Institute (Australia) and the University of Melbourne (Australia), and a member of the ARC Centre of Excellence in Convergent Bio-Nano Science and Technology. Mattias is passionate about science policy, and research strategy and communication. He is an Associate Editor of @anglejournal and can be reached via Twitter @bearore. His ORCID is 0000-0002-9876-7079. Interestingly, that is – as i understand it – the business model for ResearchGate. There are perhaps lessons to be learned from that, one of which might be that a business model based on services does not necessarily lead to greater competition? Very thought-provoking post–thank you very much. Another part of the mindset change towards knowledge-as-a-service and connecting researchers with research should, I think, be a change in attitudes towards types of academic output. In the UK Research Excellence Framework, handbook chapters cannot be submitted as outputs because they are not original research. This applies no matter how comprehensive they are, or how good an overview of the state of the art they provide. I’d argue that a good handbook article is as much of a service to one’s discipline as a cutting-edge research article. Not more of a service–cutting-edge research is always needed–but certainly as much of one. I agree with the focus of knowledge for learners and society. I am not so concerned by the economic model of publishers. The challenge should be taken by teachers and researchers, for instance in content curation work, finding, selecting, elevating and sharing information from the overload produced. The move toward knowledge-as-a service has been happening fir at least a decade, and big commercial publishers like Elsevier have been in the forefront, buying up companies like Mendelay and bepress. Unfortunately, like so many other articles, this one ignores the very real differences between journal and monograph loublishing. Publishers play a far more central editorial role in the latter than in the former, so the shift to digital publishing does not affect their role nearly as much as it does for journal publishers.